As we enter a new year, we think about resolutions and all of the things that we want to accomplish. As a Reserve Officer Training Corps (ROTC) Instructor, I think about what I want to emphasize to the cadets in my program, how we can best conduct training this semester, and how we can continue to attract quality cadets to our program. One term that has been echoed in ROTC recruiting circles is that we need to emphasize leadership. I think this is an interesting way to phrase what ROTC is because it sums up the core of what we are living and teaching on a daily basis. Accordingly, the goal of this article is to provide information about what Army ROTC is, what we do, and invite those who think they may have what it takes to become an Army leader to answer the call to serve their country by signing on with Army ROTC. Army ROTC is the source of commissioning for a majority of officers serving today and has been for over one hundred years. The mission of every Army ROTC program is to recruit, train, and produce Second Lieutenants for the United States Army. In many ways, Army ROTC is like a sports team, with the goal being to prepare cadets to operate at the professional level. Less than one percent of Americans serve in the military; one in five of them serve as officers. Each year, there are over 20,000 Army ROTC cadets training on campuses across the country. Upon graduation, each will receive a commission into the United States Army, Army Reserves, or National Guard. Evaluative criteria for cadets is based on their grade point average, physical fitness ability, and demonstrated leadership as evaluated by their professors and peers. ROTC Instructors work with cadets on a daily basis to provide mentorship and guidance to facilitate their success. While in ROTC, there are requirements both in and outside the classroom. With ROTC programs spanning the nation, each will be a little different, but there are a few things that are standard across the board. In the classroom, a cadet will learn about the Army, skills like map-reading, as well as tactics and leadership. Outside of the classroom, cadets will conduct physical fitness training and learn how to apply what they have learned in the classroom. Physical fitness training may consist of running around the campus and local area, intensive circuit workouts, or playing team sports like football or soccer. Field training exercises are used to give cadets the opportunity to practice and apply their tactical knowledge, land navigation, and survival skills in an austere environment. Typical field training exercises take place on military training areas close to the program’s university. As part of their training, cadets are involved in planning all training events with instructor oversite. The goal of classroom and field training is to educate cadets and prepare them to succeed in ROTC. If you or someone you know is interested in Army ROTC, you can visit a ROTC program at any major university or go to www.goarmy.com/rotc.html. Instructions for how to apply for a full-tuition scholarship, how to join a ROTC program, and contact information are all easily accessible on the site. If you are currently an undergraduate college student, you can join ROTC before your junior year by attending a four-week summer course that will serve to compress the training covered during freshman and sophomore year. College students who are already in their junior or senior year can still join ROTC, but will need to be accepted into a graduate program in order to allot them the time needed to complete ROTC training requirements. Many ROTC programs have Facebook pages and regularly post about ROTC activities and cadet accomplishments. There is no better time to take that next step than right now. 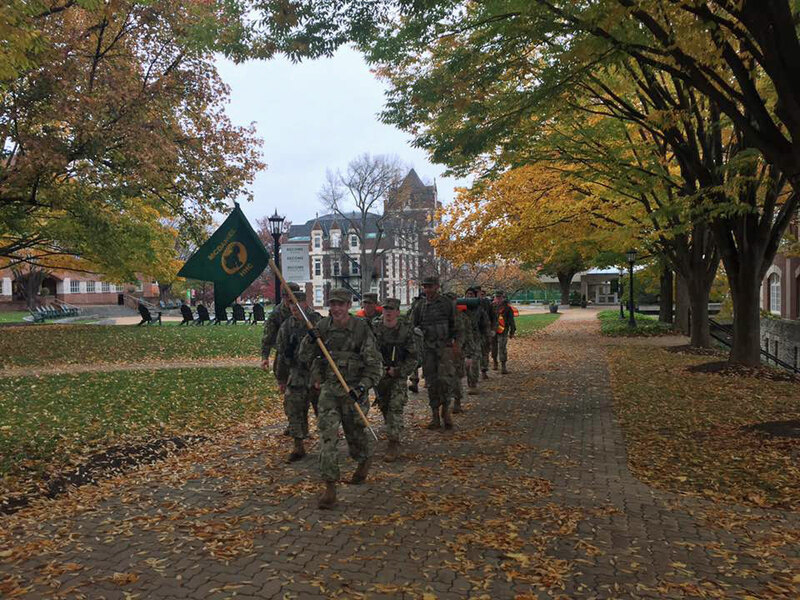 McDaniel College Cadets conducting a ruck march around the campus. About the author: He received his commission in the Army from ROTC and has served for eight years.